This workshop is designed for the purpose of understanding and practicing LEAN principles under the guidance of Prof. Yu-Hsiu Hung (NCKU, Taiwan) and Prof. Ji-Hyun Lee (KAIST, Korea). 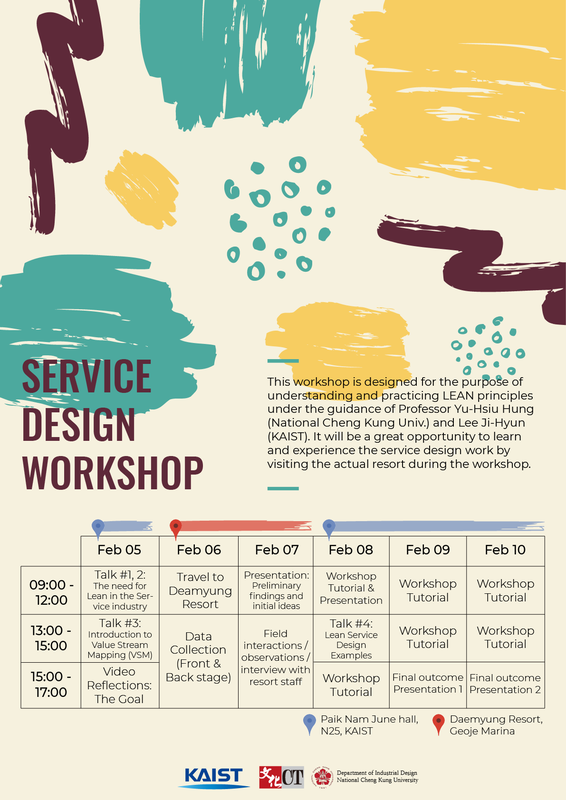 It will be a great opportunity to learn and experience the service design work by visiting the actual resort during the workshop. 본 워크샵은 대만 국립성공대학 (NationalCheng Kung University)의 Yu-Hsiu Hung 교수님과 KAIST 문화기술대학원 이지현 교수님의 지도 하에, Lean principles에 대한 이해와 실제 적용을 목적으로 기획되었습니다. 워크샵 기간 중에 실제 리조트를 방문하여 서비스 디자인 업무를 수행하는 이들의 백스테이지를 경험하고 이를 기반으로 서비스 디자인을 학습하는 좋은 기회가 될 것입니다.